Peterloo Plan from State Trials, 1820. 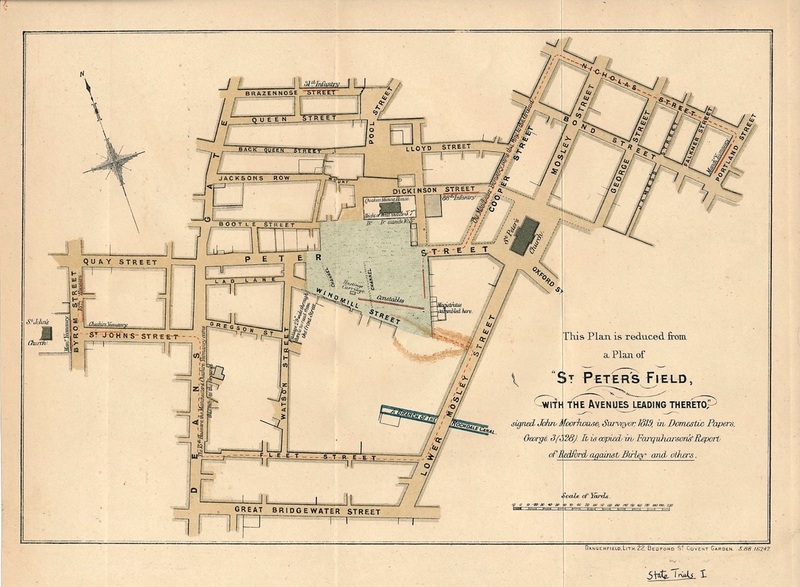 (a) The Contemporary Plan of St. Peter’s Field which appears on the following page was published in Farquharson’s verbatim Report of the Trial in 1822. As the lettering is small, some explanation is necessary. The shaded area in the centre represents the open space on which the tragedy was enacted. To the south of it is clearly seen the “raised ground” mentioned by Stanley, and shown also in his Plan. The windmill which stood near, and gave its name to Windmill Street, had disappeared some years before. The site of it is now occupied by the Central Station Approach. On the shaded space are marked: “Hustings;” “Carriage” (i.e., Mr. Hunt’s carriage, marked also on Stanley’s Plan); the double line of “Constables;” and the “Manchester Yeomanry,” drawn up in front of the row of houses in Mount Street, labelled: “Magistrates assembled here.” The Friends’ Meeting House is marked “Quaker’s Meeting House,” and the enclosing wall is stated to measure in height “3 ft. 7 in. on the inside” and “10 ft. 3 in. on the outside.” These measurements would be inserted, probably, in connection with the statement that one of the Cavalry jumped his horse over this wall. Apparently a gate and posts cross Mount Street in front of the Meeting House, and lead into “St. 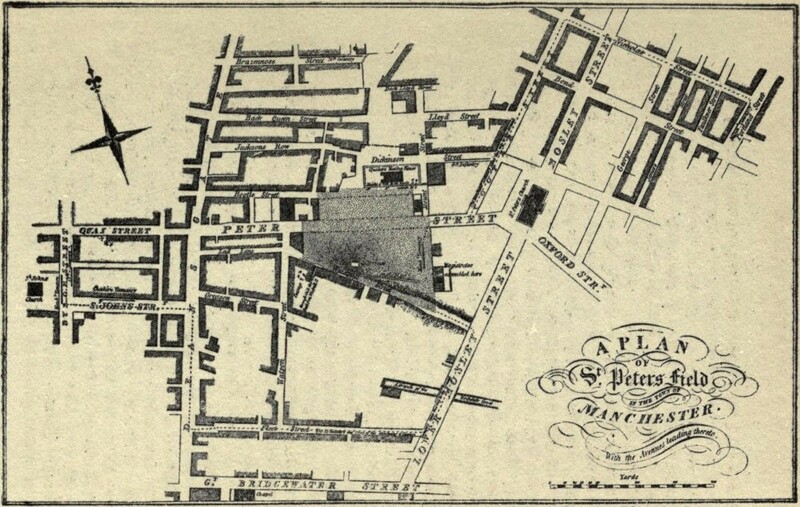 Peter’s Field,” across which two dotted lines indicate the projected line of Peter Street. The position of the Troops and the line of their approach to the Field are shown as follows: The “31st Infantry” are drawn up in Brazennose Street, the upper end of which is also blocked with a gate and posts; the “88th Infantry” are lined up in Dickinson Street; in Portland Street are the “Manchester Yeomanry,” and their course is shown by a dotted line up Portland Street, along Nicholas Street, down Cooper Street, and then round the corner of Cooper’s garden wall (now the site of the north-western corner of the Midland Hotel) into Mount Street; the Plan stating that “The Manchester Yeomanry came this way to the ground;” another troop of the “Manchester Yeomanry” is drawn up in front of St. John’s Church, in Byrom Street; facing them, in the same street, are shown the “15th Hussars” in two sections, presumably representing the “two squadrons” mentioned by Lieutenant Jolliffe in his letter; lastly, the “Cheshire Yeomanry” are drawn up in St. John’s Street, off Deansgate, and the line of approach of all these mounted troops is shown by a dotted line passing along Byrom Street, St. John’s Street, southward down Deansgate, then along Fleet Street, up Lower Mosley Street, and along the “raised ground” already mentioned to St. Peter’s Field, the inscription on the Plan reading: “The 15th Hussars, one troop of the Manchester and Cheshire Yeomanry came this way to the ground.” The artillery are not shewn. The scale of yards given on the Plan shows that Stanley’s estimate of a hundred yards as the distance from Mr. Buxton’s house to the Hustings was exactly correct. Source: D. A. Bruton, Three Accounts of Peterloo (1919), 89-90.